Bernard Cornwell, the "master of martial fiction" (Booklist), brings Thomas of Hookton from the popular Grail Quest series into a new adventure in 1356, a thrilling stand-alone novel. On September 19, 1356, a heavily outnumbered English army faced off against the French in the historic Battle of Poitiers. In 1356, Cornwell resurrects this dramatic and bloody struggle—one that would turn out to be the most decisive and improbable victory of the Hundred Years’ War, a clash where the underdog English not only the captured the strategic site of Poitiers, but the French King John II as well. 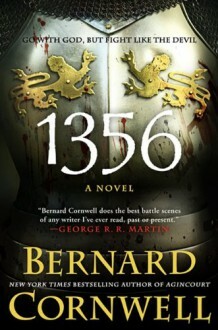 In the vein of Cornwell’s bestselling Agincourt, 1356 is an action-packed story of danger and conquest, rich with military strategy and remarkable characters—both villainous and heroic—transporting readers to the front lines of war while painting a vivid picture of courage, treachery, and combat.